The south western end of the Southern Upland Way starts on the shore at Portpatrick, within sight of Northern Ireland and it crosses Scotland to the North Sea. 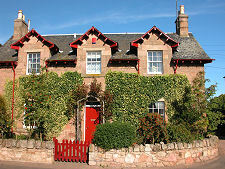 It ends at Cockburnspath, which can be a little confusing, for this attractive village lies several hundred yards inland. 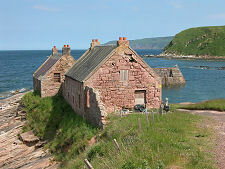 Though it terminates here, the Southern Upland Way actually strikes the shore of the North Sea a little to the south east before skirting the cliffs above the harbour at Cove and curving back west, inland, to Cockburnspath. Most of today's Cockburnspath (pronounced Co-path) is strung from north east to south west along a single minor road. This terminates at a junction with another quiet road, overlooked by the village garage and war memorial. This junction is also home to the marker showing weary walkers of the Southern Upland Way that they have indeed reached the end of their journey from Portpatrick. 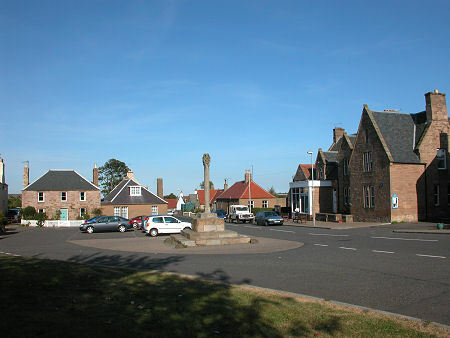 Today it takes an act of imagination to realise that until 1993 the now quiet road running past the end of the village was the main A1 from Newcastle to Edinburgh. 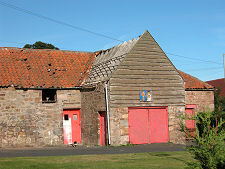 Cockburnspath itself centres on the Market Place around which it originally grew. The mercat cross at its centre was erected in 1503 by James IV to celebrate his marriage to Margaret Tudor, sister of Henry VIII of England. 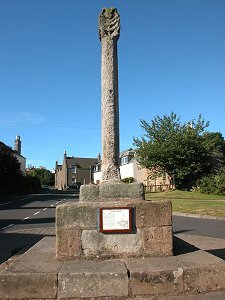 James presented the lands around Cockburnspath to his new wife as a dowry, and to signify a new era of peace between Scotland and England. Just 10 years later James met his end in an ill-judged and unnecessary invasion of England that culminated in what was for the Scots the catastrophic Battle of Flodden. 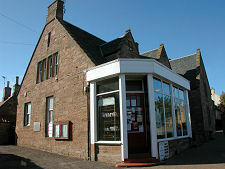 Cockburnspath's most attractive asset is hidden away through a gap between the village shop and the neighbouring building, opposite the mercat cross. 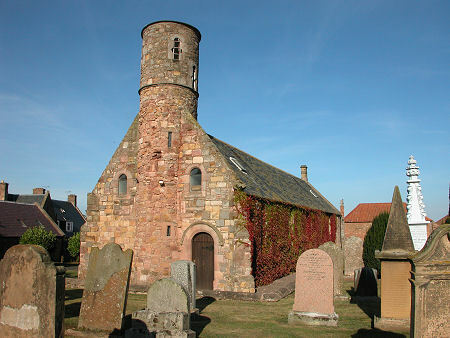 Here you find St Helens Church, now the focus of the Parish of Dunglass. 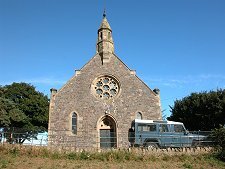 The church dates back to the 1500s, though much of it was reconstructed in the 1800s. The main clue to the early origins of the church come from the unusual circular tower at its west end, a tower that shows signs of being rather shorter than when originally built. At the east end of the church is a stone-roofed burial vault. 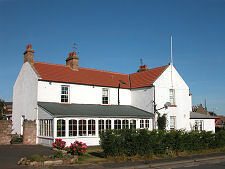 For many people, Cockburnspath is no more than a couple of road signs on the A1 as they head north from Berwick-upon-Tweed towards Dunbar. For others it is vaguely glimpsed from the East Coast Main Line railway, though the village's station on the line closed as early as 1953. 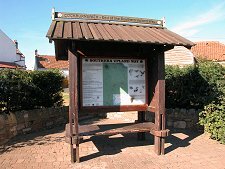 What this means is that unless you are a footsore trekker along the Southern Upland Way, there's no actual need to visit the village: which in turn greatly adds to its attraction for those who do know of its charms.